Author: Catherine Griefenow-Mewis. Series edited by: Wilhelm J.G. Möhlig, Bernd Heine. Somali belongs to the Cushitic Languages and is spoken by approximately 10 million people in Somalia, Ethiopia, Kenia and Djibouti. In the early 1970’s this language established as the official, educational, and state language in Somalia, its standardization was speeded up by an expansive alphabetization campagne. Nevertheless, because of the civil wars and the bad political and economical situation in general, a continuous development of the literary language is still prevented. The book begins with an introduction to the phonology of Somali. The vowel length is marked by a double spelling of the vowel, syllables with dynamic accent are marked with a high tone. The texts in this work are nearly the same as in the last edition, changes in the orthography are due to the latest developments of the standardization process. There are now 19 lessons, everyone beginning with a text and a vocubulary list, followed by a brief description of the grammatical material introduced there. They also contain practical courses with different types of exercises, and a concluding text with a vocabulary list. Finally, the book comprises two glossaries, Somali-German and German-Somali. The aim of this textbook is to impart knowledge of the Somali language as a basis for both active and passive use, and it can also be used by autodidacts. The basis of this work is the Standard or Common Somali. A complete adjustment of the orthography of the different texts is neglected deliberately to not pretend a linguistic purity which does not correspond to the reality. 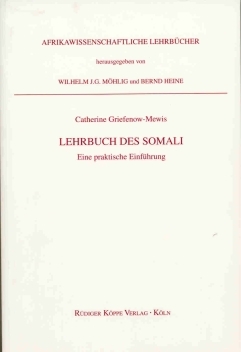 In addition to the Lehrbuch des Somali, a grammatical sketch in English is also available in our programme (see the links below). Furthermore, the author published textbooks on Oromo in our programme, as well a she co-edited a proceedings volume on Cushitic and Omotic languages. The authoress combines the presentation of grammar with active approach to lexicon and conversational skills. This is the best German textbook of Somali and one of the best in general. Every student can learn a lot using the book with the help of a Somali informant or even working alone. […] Catherine Griefenow-Mewis has done a formidable job in explaining the language by giving rich exemplification and elucidation of various grammatical constructions.